Royals undertake a wide variety of engagements, and we think one of the most enjoyable is the opportunity to attend premières of the year's best movies. For royal fans, the appearances have become some of the best loved on the calendar, thanks to the magnificent gowns we see the Duchess wearing. Did you know Kate attended a couple before she married William? In November 2009, the then Kate Middleton made a rare public appearance for the première of Tenacity on the Tasman, held at the Odeon Leicester Square. The movie charts the story of Olly Hicks, who at 23 became the first person to row solo from America to England. A keen rower herself, Kate was joined at the première by Holly Branson, whose father Sir Richard Branson helped to finance the movie. Kate and Holly were quite close before the royal wedding, enjoying nights out - most notably Ms. Branson's Day-Glo-themed roller disco in 2008 - which raised funds for Kate's patronage Place2Be. During Kate's split from William, Holly invited her for a girls holiday on Richard Branson's Necker Island. We haven't seen the two together in years. Interestingly Holly's brother Sam married Isabelle Calthorpe, an old flame of Prince William and half-sister of Prince Harry's ex Cressida Bonas (these royal circles are close ones). I actually remember reading about this event quite well, as it made many headlines and became a memorable pre-engagement appearance for a number of reasons. Firstly it was quite surprising to see Kate publicly at that time (unless one counts paparazzi photos); secondly engagement rumours were rife at the time; and thirdly for her look on the night. The outfit epitomised Kate's style before the wedding with a pretty fitted short dress, flat black suede boots, a stylish scarf and chic accessories from the high street. You may recognise Kate's black jacket as the Ralph Lauren garment she wore the day after the royal wedding. It's been something of a staple in her wardrobe for several years. Just a few weeks later, Kate joined William and Harry for the London première of Guy Ritchie's 'Sherlock Holmes' starring Robert Downey Jr. and Jude Law. Unlike the first première we looked at, the trio were determined to avoid the photographers' lenses (it would take Mr. Holmes himself to avoid the paps at a première) and in order to do so, pointedly avoided the red carpet, which had been transformed into a Victorian street, and arrived five minutes after the movie had begun and exited using the back door. Clarence House said they didn't want to turn the opening night into a royal circus when it was an occasion for the actors. In January 2012, the Duchess of Cambridge attended her first première as a member of the Royal family. Steven Spielberg's War Horse was screened in London's Leicester Square in aid of The Royal Foundation of the Duke and Duchess of Cambridge and Prince Harry. The moving drama is set during World War One and follows Albert who enlists after his beloved horse Joey is sold to the cavalry. The movie adaptation followed on from the success of the play which coincidentally William and Kate went to see in 2009. After the screening Mr. Spielberg revealed the emotional movie moved the Duchess to tears and he passed her some Kleenex. The Duchess looked stunning in the Temperley London 'Amoret' gown. The black lace dress with scalloped eyelash edges features a removable crepe bow belt. Such was the popularity of the garment, Temperley London released it and saw it sell out, with many 'Repli-Kate's' hoping to emulate the red carpet look. Kate adores the dress and wore it again for the advance screening of David Attenborough's Alive 3D at the Natural History Museum. There was an informal feel at the African Cats première in April 2012. The nature documentary follows a lioness and a cheetah with their offspring in Kenya's Masai Mara nature reserve. Narrated by Samuel L. Jackson and Sir Patrick Stewart, a portion of the proceeds went to the African Wildlife Foundation and the première was in aid of William's patronage Tusk Trust. 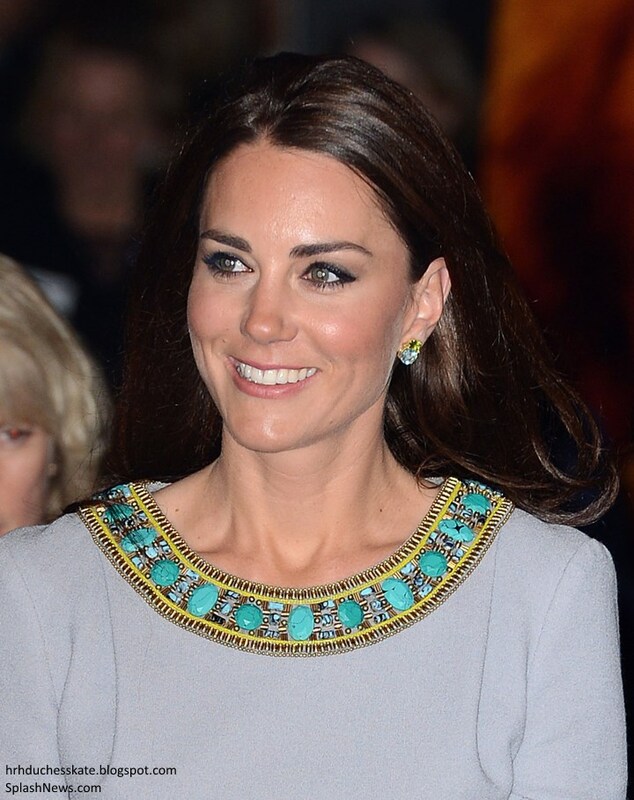 Kate chose an elegant dove grey dress with turquoise and gold encrusted details on the cuffs by Matthew Williamson. It was a fun event with 100 children from William and Kate's patronages present. Last December the Cambridges were all smiles as they walked the red carpet for the première of Mandela: Long Walk to Freedom - the year's Royal Film Performance. Since King George VI attended a screening of A Matter of Life and Death in 1946 it has been royal tradition for a member of the Royal family to be present each year. The Duchess brought back her very popular Roland Mouret 'Ella' gown for the night. Kate had a lot of input in the design of the bespoke piece. The designer later described working with her: "She's a fantastic person to work with. She's a woman of her time and a really nice person." Kate teamed it with a sparkly necklace from Zara. Sadly, after the première guests were given the news Nelson Mandela had passed away, aged 95. The audience held a two-minute silence and as they left William made a brief statement: "I just wanted to say it's incredibly sad and tragic news. We were just reminded what an extraordinary and inspiring man Nelson Mandela was,"
Away from mingling with the stars at events, William and Kate enjoy nothing more than taking in a good movie at the local cinema anonymously. During their time in Anglesey they were spotted ordering popcorn and watching Bridesmaids and in London they saw The Avengers at their local Odeon cinema. Indeed, the couple's romance inspired a made-for-TV movie titled William and Kate. Now, if you haven't seen it, one could say it's not terribly accurate and for those who have it wasn't an Oscar worthy effort, however, it was all in good fun and coincided with the buzz and atmosphere surrounding the Royal family. I have seen the film, well it was interesting. You're very welcome. I thought it would be fun to do something a little different as this is a quiet week. I also hope to have a fashion post up before the weekend! This was a fun post, good idea on the theme. I also loved the dress she wore to the African Cats premiere, one of my all-time faves. IIRC that one was slightly altered to have more beading on it. Maybe Charlotte adds some dresses from Polish site: http://modbis.pl/product-pol-3648-Sukienka-damska-Flori-II-wyszczuplajaca-kreacja-wyjsciowa-.html I really like the dresses from the site. They cost about 40 pound each. Quite a lot for a Pole. But the dresses are quite in Kate's style: very simple and classy, and still low budget (comparing to 200 $ and more for a dress). thank you for this lovely post. Yes, the Kate loves posts are amazing. Especially when they give some information on her life before being a Duchess. I love Kate at movie premiers. To bad she missed the one with The Hobbit while she was pregnant with George. I love Kate Loves posts, they are my Favorite!! Yes, it was so sugary it was actually almost funny. The dresses are amazing. I hope we see William and Kate at a premiere in the near future! A fun and well-put-together post, thank you! Thank you for commenting Martha! Yay, I adore 'Kate Loves' posts!!! This whole post harkens back to when, I personally believe, Kate's style and wardrobe were at their peak and I was obsessed. The black Temperley remains my absolute favorite thing she has ever worn. The made for TV movie was all kinds of awful, and as I watched it I was aware of how awful it was..but I got a kick out of it anyways, lol. Have a blessed day (err, it's evening over there) Charlotte! It is just after 11 p.m. here Amy. I loved Kate's style the most pre-engagement and in the year after the wedding. She's had some amazing looks since then, but she does play it very safe which I guess is a good thing considering her position. We see very little of her "off duty" style now compared to pre 2011. I tend to agree that she is playing it rather safe. And seeing photos from her single days makes it clear that it's a conscious choice on her part. I agree about Kate's style before her wedding, It was casual yet elegant. Thanks for this fun and informative read, Charlotte! Agreed she plays or very safe now. But safe also runs a little on the boring side recently. I loved her pre-engagement style as well. And definitely her first year of marriage. Also I say this every time I'm begging to sound like a broken record lol, but I firmly believe Kate had a stylist her first year of marriage. Interesting about the stylist theory. I don't know. I thought she played it safe all along. It's just that in the first year we saw new pieces because she stepped into her new role. True Kate has always played it safe, we've never seen her in something truly daring or fashion forward but I think in her first year of marriage after realizing there was more publicity on her than she expected she wanted to make for sure she looked her absolute best. At all times. We barely saw her with a hair out of place, and her outfits were more put together and had just an edge of her former chic single girl style. Now we're seeing more of her style that she puts together herself. Like the Place2Be engagement outfit. Thank you Rebecca, I do so enjoy chatting with all of you! Yay!! Another "Kate Loves" post. These are some of my absolute favorite posts of yours Charlotte. They're great. I always love seeing old pictures of Kate before she was a Duchess. I love that black suede outfit she wore to Sherlock Holmes premiere, it's very cute!!! How are you going to cope with the time difference when the Cambridge's are in New York, Charlotte? Lots of coffee lol. But it won't be as bad as the Aus/NZ tour time difference. Blair - The New York time difference is a blessing compared to NZ/Aus. It's a short trip and I don't believe we'll see a huge amount of them for much of next year so it should be an enjoyable one. Taunya - I could be wrong but I wouldn't think so for some time. Erika - I think the first half of the year will be quite followed a return to duties for annual events such as Trooping the Colour and The Queen's Garden Party. January and February tend to be quite months for Kate and one expects she will go on maternity leave sometime in March. Yes, Im afraid you're probaly right Charlotte. Completely different timing this time around. I was hoping she would she would compensate for the time off by stepping up her engagements during Jan and Feb.
Fun to watch the transformation of style from pre-engagement to Duchess! I love that black Ralph Lauren jacket. Didn't she also wear it over the polka dotted dress when she was pregnant with George and visited Warner Bros. with William and Harry? Its interesting to see William in trainers and Kate in heels in that one shot. I don't think I would ever wear heels to a movie theater - even on a date night. If they were going out later - they are not dressed for similar environments. Doesn't seem weird to me :-) They were in London in that photo, so maybe she thought she should step it up a notch. Or maybe she wanted to be dressed up a bit more for a date night. I definitely go casual with my husband at times, but sometimes I also go a bit fancier than him for even low key dates. I disagree, they could still go out after. Just because she is wearing heels doesn't mean she is dressed nicer. They look like small basic black heels. 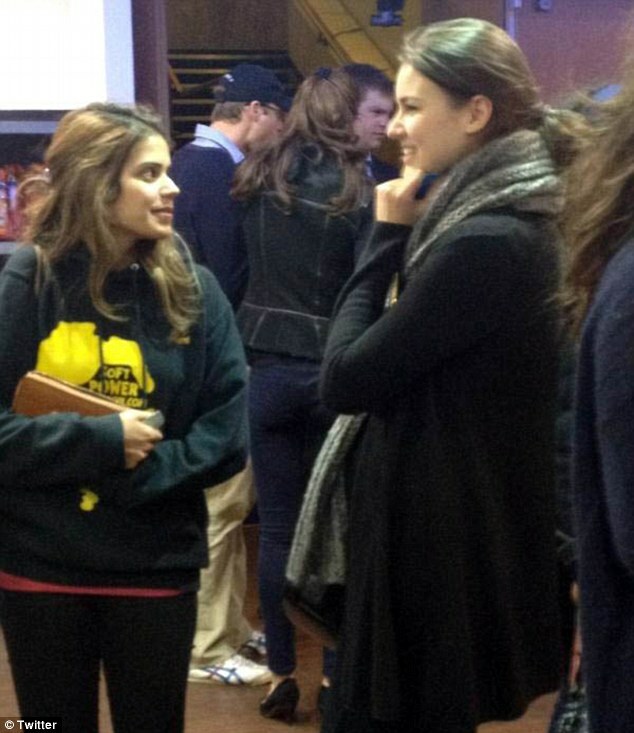 She is wearing jeans, so pretty casual. Besides the rest of Will's outfit is nicer than the trainers, so I think they are both dressed casually-nice. I wear heels all the time when I go out with my husband (he wears trainers too). I think it is pretty common to wear heels. I love them!! I will say thanks for pointing out the shoes. I had not seen them. I was happy to see she owns shorter pumps. Kate pretty much lives in heels. I see your point that she isn't as dressed up - she's wearing skinny jeans to his khaki's. (Rebecca I'm referring to the one photo where we see the backs of them and they are not out "officially") It was the difference in shoe types that created such a contrast. I love the blue outfit from 2009. Her style was so fun before the wedding and she wore more of a variety of jewelry. I love seeing old photos of her, so thanks for that. I would love more candid photos of her from before the engagement if you ever feel like it :). I know they have met movie stars, but I hope they get excited to meet them just like anyone else would. This is an off topic question but it is something that has bothered me for some time. Does anyone know why "Kate" is spelled with a "k" and "Catherine" is spelled with a "c"? Lol! I too always wondered why it was not Cate. A Catherine in my family goes by Katy. I think it's a common combination. Mine too. My mother in law is Catherine but goes by Katy. What an interesting retrospective post, thank you Charlotte! We can so clearly see Kate evolving from twenty something girlfriend to royal wife in her thirties. Not that the transition is totally complete. The Williamson dress is not one of my favorites; I was surprised that I liked the recently worn Williamson coat so much. I also thought the crystal necklace was a bit of a miss. But I do love the Temperley gown and the black suit. I should have said, during the comments on the previous post, that the Detroit dress is my favorite of Kate's day dresses. I am enamored of several of her dark evening dresses, including the one she wore recently. And the glittery ones, too. She can look really, truly elegant when everything falls into place. How about a "Kate loves Handbags/Totes"? Thank you for all you do to honor Kate and her fans! What an interesting post. What comes across to me is it appears that Kate leads a far more lonely life now. Before her marriage she clearly had a number of close friends and was quite often photographed walking with friends whilst pregnant with George but since George was born she is always on her own in any pap snap one wonders what has gone wrong. I am sure she must miss the friends she used to spend time with who were her friends rather than part of William's set up. She used to look so much more relaxed. On another topic I am somewhat intrigued to see that she has not worn her watch on any of the engagements she had undertaken since she was side lined with HG. The watch was never off her wrist for months before then even if it was somewhat heavy for some of the functions. She certainly has fads one never saw her with a watch for years then one appears and then disappears!! Mary I noticed the friends thing too. I believe she let a lot of friends go when she was dating William due to having to be flexible with his schedule. I don't think she really has anyone close other than her mom and sister, IMO. I also noticed the watch thing as well. She does go through fads. The watch she wore all the time and now stopped. Or when she was pregnant with George she worn that ring on her right had with a ruby all the time(it caused speculation on when the baby would be born). It is interesting how she will be obsessed with a piece for awhile and then never wear it again. Kate certainly does look like Pippa in some of those older shots, doesn't she? Especially the Tenacity on the Tasman and Sherlock Holmes premieres. Maybe it's the eye makeup? Slightly fuller face? Being in a relationship that long she probably did naturally lose friends and establish relationships with Wills friends. When you live with your boyfriend your lives are already so intertwined that you are more one person (at least that's how it was for me before our marriage) we were always invited to couples things but I sometimes wouldn't get invited to girls nights because I am always working or with my boyfriend. We don't see our friends much except for weddings and annual girls summer trip. We keep up with everybody through Facebook. Now that I have a child, and they are still newlyweds or engaged I have more interaction with mom's in playgroups and church. I hope she and George have play dates and a safe environment for her to talk about motherhood. I would go crazy without having mom's tell me things are normal and advice on how they handled "phases". My son didn't sleep through the night until 10 months, he teeths horribly, sicknesses, silly moments with the dogs. I wish she could just come out and tell us, don't worry guys I have friends with kids, I do get out of these houses and have somewhat of a normal life see, here's my Facebook or my instagram. Please Kate speak! I don't think we can establish anything about Kate's friendships based on not seeing them. One thing that happens as you get older is that you now have houses and estates to entertain people. When you are younger you tend to rely on clubs to entertain yourselves as your apartments aren't really big enough and no one wants to clean up. Their crowd now have their own homes and staff and their entertaining is done privately with house parties and overnight stays. Had Kate not gotten ill, they were throwing Harry a 30th bash at their Kensington home according to reports. No need or desire to socialize out in public spaces anymore. Moxie, I totally agree. I too believe it's more a case of a different lifestyle/circumstances now vs. her single days. I'm interested to see if the protests in NYC will be going on during their visit... there is a lot of unrest here (throughout the US, I think I can say generally right now) regarding two different grand jury decisions regarding police officers and deaths of black citizens. I have my opinion on both cases; but there have been two days of protesters in the streets of new York blocking traffic. This is a random question. Charlotte, do you know when William and Kate attend the basketball question will they be sitting courtside or in a private skybox up high? I would think for security reasons, they would prefer them to sit up high, like we've seen with them at previous sporting events but at the same time for PR reasons they would be sitting courtside, but I just wonder would they want all that attention on them the entire game. It might get uncomfortable. Thoughts anyone? We don't know, however I'm thinking a private box for security reasons. What do you all think? To put it in perspective - the basketball player LeBron James that they will be watching has more money than the royal family. Security is always tight at basketball games because of the close proximity to the players and because famous wealthy people are always in attendance. I think they will spend some time enjoying front row seats on the floor for the experience and exposure, but move up to a party suite to socialize and relax out of sight after a bit. That was my thought as well. I was speaking with my sister-in-law and we both thought the same. I'm pretty sure the NBA would love to have them courtside(especially with the rumors that Beyonce and JayZ might be attending the game as well, and it would be a great photo op of Kate and Beyonce sitting next to each other) but I don't think it will happen. Too many risks having them sitting exposed like that courtside. Also excuse my grammatical errors, I just got a manicure and it's so darn irritating trying to type with nails lol. Lebron James has more money than the royal family?! I'm not too sure about that. There's no denying that he's a wealthy man, but I think the British royal family as a whole has way more money. Also I read that he would be the one greeting them before the start of the game, so perhaps they'll be on the floor for a few seconds for the meet and greet, then move to their private box. I've been to a few basketball games and there's always security no matter what, it's going to be way more heightened at that game. And with Will and Kate's protection officers always so close to them, I think in a more exposed public situation in a foreign country they'll want to be as close to them as possible. Like on other tours. Only time will tell though lol. I'm certain no one wants to risk some unruly fan tossing a cup of beer at them from a few rows up so I would think they might watch courtside for a short time and then move to a box. I suspect Kate has friends but they remain out of sight for the most part. They have chosen to settle in an area where a lot of their rich friends (at least of William) live and there will probably be a lot of private partying. At the risk of sounding cynical, I suspect Kate backed away from the Bransons once their usefulness before her marriage was finished. They helped her stay in the royal circle but now she doesn't need that. There may be some concern about their very public image and their close ties to both Isabella and the York girls. There has always been rumours Kate doesn't get on with the latter but it may simply be that they are a lot younger. Hey Leo, I keep hearing that Kate doesn't get along with the York girls. I am genuinely curious why people think that? They seem nice to each other in public, which I know doesn't mean anything :). I see in this mornings Court Circular that Kate attended a board meeting and reception yesterday evening at the Goring Hotel for the 1851 Charity of which she is Patron. I think that is the new one connected with sailing and youth which she took on very recently. No pictures have emerged. Returning to the Goring Hotel will no doubt brought back happy memories for her! I do hope all the unrest in New York does not affect their visit. There has been quite a lot about it on BBC TV. but never having been to New York I have no idea whether it is in the area they will be staying. I am looking forward to seeing the Photos of their tour. I hope it is well covered even though it is not a major tour. What a fun post, Charlotte, thank you! I'd forgotten the embellished frock, I like it better now than the first time I saw it. I predict on the day of William's coronation, many years from now, Kate's photo in those neon yellow shorts will go worldwide as her middle-aged self in stately attire will do.. There are ongoing street demonstrations in New York and Washington (and many other cities) that are peaceful but disrupting traffic flow. Kate's visit to Harlem could be a target, I think. Probably the street will be closed to prevent protestors interfering with her arrival with the mayor's wife. I do not believe the Royals are at any risk but there are an opportunity for publicity. Looking forward to a full report on her wardrobe and what William has to say about ending wildlife poaching, a cause close to my heart.